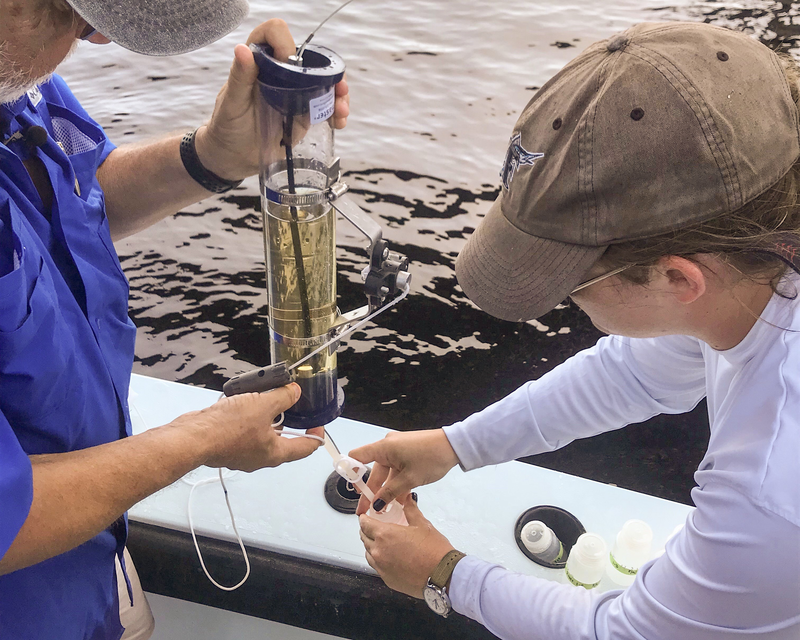 Dr. Bill Mitsch and Ph.D. student Lauren Griffiths take a water sample from the Caloosahatchee River to determine where the nitrogen in the water originated. While some observers of Florida’s water woes see an obvious correlation between Lake Okeechobee releases and the worst red tide outbreak in modern memory, scientists are trying to pinpoint the cause through research. The phrase “all hands on deck” is cliché, but it was the literal situation on a boat on loan from a Captains for Clean Water member last week. A team of FGCU scientists led by Dr. Bill Mitsch joined local fishing guides to navigate the back bays in Southwest Florida toward the Caloosahatchee River. They were there to collect a water sample that Dr. Mitsch will take back to the lab to analyze. He was looking for specific isotopes of nitrogen. To collect the water for testing, Mitsch used a Van Dorn water trap, which he dropped about a foot down into the murky brown Caloosahatchee under the US 41 bridge. While doing so, he chatted with Captains for Clean water co-founder Daniel Andrews about the best places to find nutrient-rich freshwater, where that water meets the saltwater line, and what the current red tide conditions are. Andrews has fished these waters his whole life. He pointed out where he caught his first snook and said the degradation of this estuary is tragically out-pacing scientific evidence of its demise. “That’s why we’re out here trying to get this data, so we can back up what we’re seeing,” Andrews said. This partnership between scientists and people like Andrews who boat and fish “about 300 days a year” means hard data will benefit from years of knowledge from on-the-water observation. It’s something Mitsch said he values. “I’m learning from him," Mitsch said. "He should probably give me college credit." After gathering a freshwater sample from the Caloosahatchee, Andrews took Mitsch and his team out into the gulf in search of a red tide bloom. Within minutes, in the middle of a rust-brown patch off Fort Myers Beach, Mitsch lowered his trap into the cloudy water as a small school of fish surfaced. They appeared to gasp for the cleaner air above, as they wriggled at the top of the water before they sunk beneath and disappeared. This sample of red tide-laden water would be examined for nitrogen isotopes to see if they matched the nitrogen found flowing out of the Caloosahatchee. Like many, Mitsch said he had an idea of what he’d find. “My hypothesis will be that when we were twenty miles out — that’s where we started yesterday 20 miles away from the shore — that we will see that the nitrogen out there it won’t be as high and we will probably see that it came from the atmosphere," Mitsch said. "As we get closer, we will see higher and higher concentrations of nitrogen and it will have a higher signal that it was coming from farmland or whatever." It’s an assertion yet to be scientifically proven because, until now, no one had tested it. But, Andrews fully expects science to back up something that seems plain as day to him and most people who make a living on the water. “It’s a common sense thing to me. You know, we’re seeing red tide in the same areas that we’re seeing other algal blooms and a lot of nutrients in the water," Andrews said. "So, yes, I absolutely do think that this red tide is being exacerbated by the nutrients in these discharges." Mitsch hopes to have results from these water tests in about a month.